Andrew A. Athens, Archon Maestor of the Ecumenical Patriarchate and president of the Archdiocesan Council of the Greek Orthodox Archdiocese for almost two decades (1974-1995) passed away on March 14, 2013. He was 91 years old. Mr. Athens was the first world president of the Council of Hellenes Abroad (SAE), founder of the United Hellenic-American Congress (UHAC) and hellenicare, co-founder of Leadership 100, International Orthodox Christian Charities (IOCC), Hellenic American Chamber of Commerce, National Coordinated Effort of Hellenes (CEH) and many other philanthropic and public benefit organizations and foundations. “On behalf of the Holy Eparchial Synod and the Clergy and Lay Faithful of the Greek Orthodox Archdiocese of America, I am offering our profound condolences to the family of our beloved and esteemed Archon and co-worker in the Lord, Andrew Athens. He was a tireless worker for Orthodoxy and Hellenism for many decades, as Archon of our Ecumenical Patriarchate, as president of the Archdiocesan Council, as World president of the Council of Hellenes Abroad and as founder, supporter and member of a multitude of philanthropic organizations and foundations. Andrew Athens was a giant and a champion of offering to the Ecumenical Patriarchate, to the Omogeneia, to Greece and Cyprus and to Hellenism in general. His passing creates a void that is hard to fill. His example of long-lasting and unselfish offering and service to Orthodoxy and Hellenism is worth emulation. In Greece, Prime Minister Antonis Samaras in a cable sent on late Thursday evening expressed his sympathy for the death of Andrew Athens, a leading figure of Greek expatriates, who dedicated his entire life to taking care of national affairs of special importance to Greece. "The Greek-American community and Greeks around the world grieve for a great Greek, Andrew Athens who dedicated his life to defending ecumenical Hellenism and played a leading role in the struggles for the rights of Greeks, in Greece, Cyprus and for the Macedonia name," Samaras says in the cable. 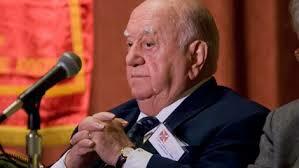 "On behalf of all Greeks, we express our warmest condolences to his family." A highly active member of Greek-American community and the so-called Greek lobby in Washington, Athens was the first president of the World Council of Hellenes Abroad (1995 and until December 2006). He died on Thursday at the age of 91 in his home town, Chicago. He was identified with the efforts to co-ordinate Greeks around the world and was an honourary president of SAE. He was honoured by Greece, Cyprus, the Patriarchate, the US government and Congress, as well as by numerous US bodies and organisations. Foreign Minister Dimitris Avramopoulos also expressed his sympathy for the death of Andrew Athens. "As a uniting personality, Andrew Athens fought from the post of president of the World Council of Hellenes Abroad (SAE) to reinforce the position of Greeks around the world, leaving a legacy of significant national and social work," Avramopoulos said, expressing warm condolences to Athens' family. PASOK leader Evangelos Venizelos also expressed his deep sorrow for the loss of "a devout patriot who fought for national rights in the US and internationally and offered his powers and prestige to the effort to organise and mobilise Greeks expatriates."